The "Osprey" or Semi Gun is designed for paddling, speed, control, and quickness in larger and thicker waves. Paddling and entry are a premium in these shapes. Performance is also an essential part of this design - quick response and maneuverability are essential to surfing effectively in these conditions. 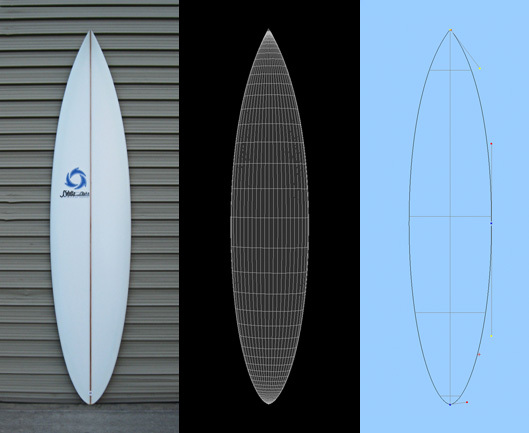 Semi guns feature the same elements of design found in a short board scaled to the conditions. Design features - Rocker: Speed box or continuous. Profile: Well foiled with a lot of hidden volume. Outline: Round Pin. Bottom Contours: Vee to single concave, vee to single to double, or tri plane to vee. Rails: Low and thin or low and full - tuned to surf conditions, surfer's size, displacement, and technique. An essential part of any surfer's quiver who charges extreme conditions.